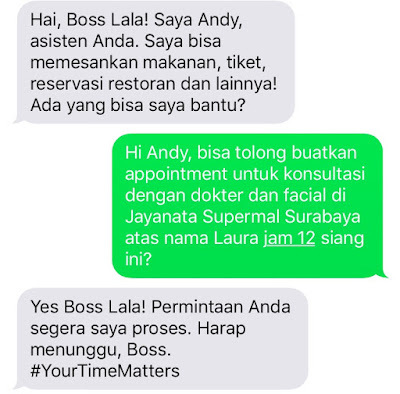 I want to share a quick fun yet super helpful experience with this personal assistant service called "YesBoss". I actually really don't know that this kind of thing existed, but IT'S FREAKIN' AWESOME! Especially for a busy person like me. But I guess anyone will always need a little help here and there, it will save you so much time and it's totally free! I'm sure this would be a life saver for everyone! 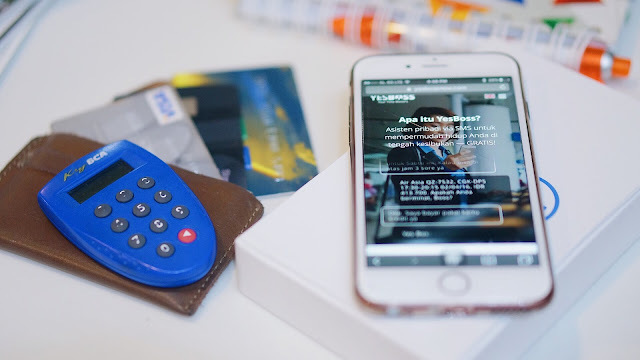 In short, YesBoss is a personal assistant service program for all your demands. You can ask them mostly anything! From buying you tickets, looking up for places and things, booking you an appointment, ordering foods and stuffs, even giving you advice. 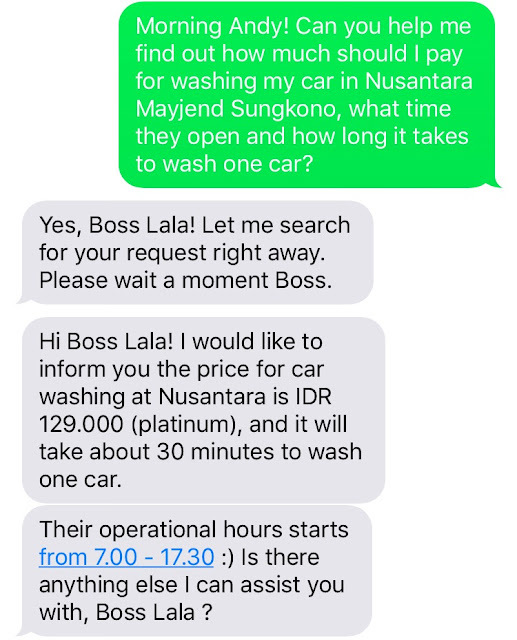 They are free of charge, you don't need to pay anything for their service, isn't it the coolest thing ever? Let me share to you my one day experience with YesBoss here. The first thing that I needed to do was to sign up, just like everyone else. I'm signing up my number and inputting my name as well as my nickname which is now used all the time. After that, we started texting each other..
First. My work has been taking a lot of my energy and my brain, causing me stress and lots of pimples are growing out of my face recently. I didn't feel like going back to my usual salon, and wanted to try a different one. So my first task for Andy was to book an appointment in that salon for my facial treatment later that day. Nailed it again. And yes! They speak English too! The last one, since I've been working so hard, and everything went pretty well, now it's time for a vacation! 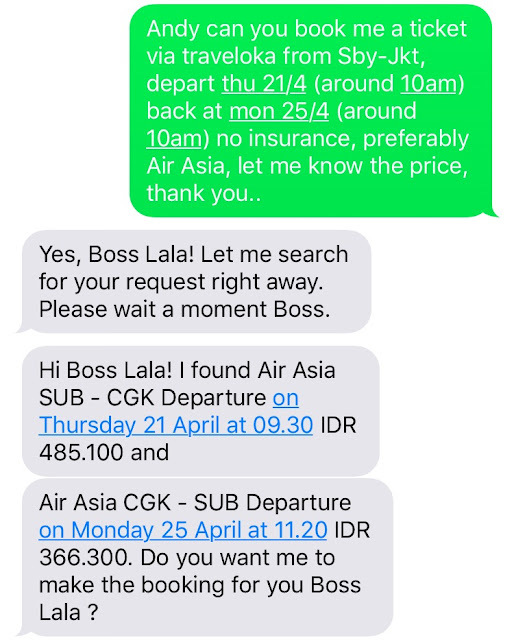 I've been planning to go to Jakarta and Bandung for a quite some time now, I think taking several days off would be a great refreshment. 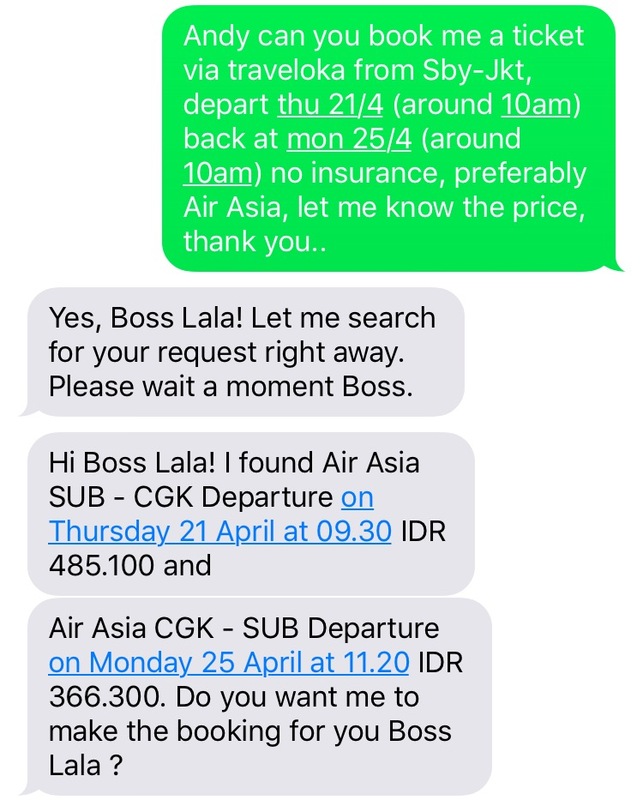 So I talked to my friends, and agreed that we're going to have a short weekend vacation to Jakarta-Bandung next week (April 22nd-25th). I also asked Andy to look up for the ticket. Gosh Andy, what would I do without you? 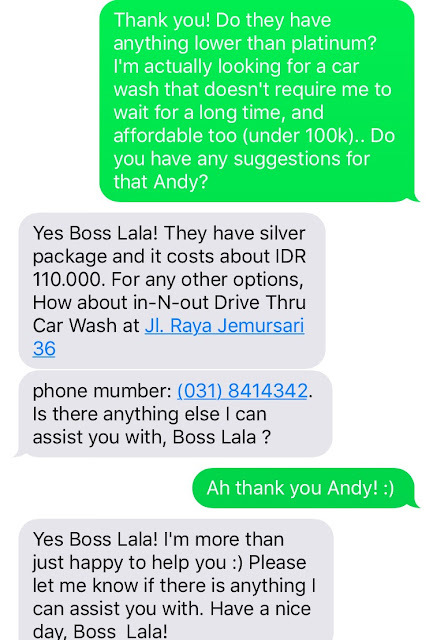 I really think Andy had helped me a lot during my hectic hours. Even though these are an easy tasks, but it's actually time consuming. Imagine if I have to do everything all by myself? I would need 30 hours a day! 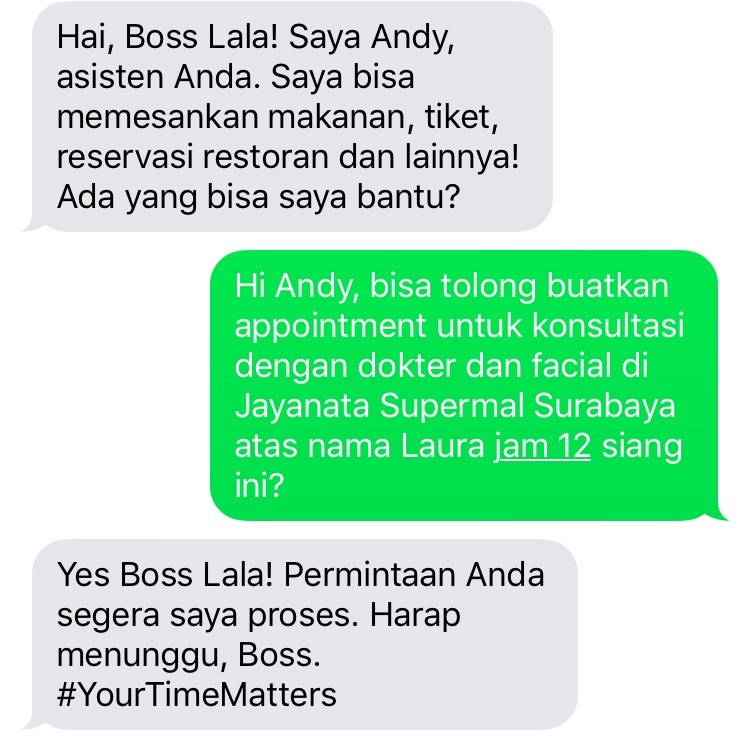 But with the help of Andy from YesBoss, I could save hours of my precious time. All I have to do was just to text him and told him what I wanted, and he would just try to make it come true. One thing that I also loved about YesBoss is the way Andy replied me, he always replied me in a way like I'm paying him $1.000 for the job, though actually I'm paying him with nothing. So polite, yet encouraging, I really appreciate that! 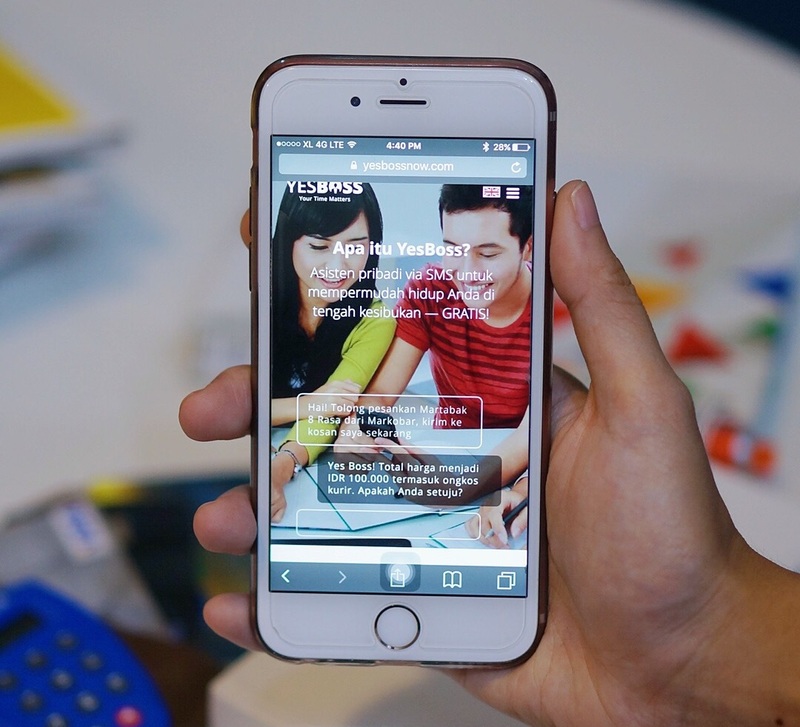 Want to try YesBoss without having to queue on the waiting list? Boleh dicoba regis ulang dear..